Some people like to turn over in bed and see someone special lying next to them. Our preference falls somewhere between the two—with a heavy lean toward the taco scenario. Well, Dallas, we now have another new location on McKinney Avenue of one of our city’s greatest fast-casual concepts: Velvet Taco. 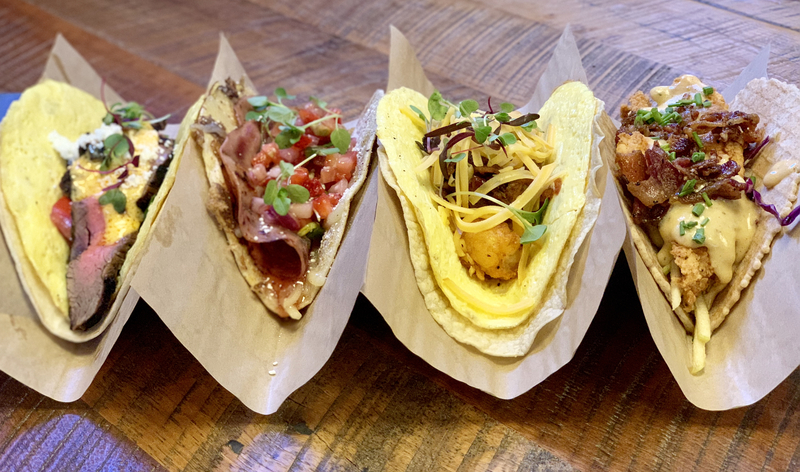 Not only do they have some of the most imaginative tortillas-wrapped-around-something creations in the business, but they’ve also launched a new lineup of brunch tacos available All. Damn. Day! The new quartet (pictured above, left to right) includes the Steak & Eggs (#21) with crispy potatoes, Sambal hollandaise, pickled Fresno peppers, queso fresco, micro greens and tomato on flour. The Monte Cristo (#20) featuring honey ham, gruyere, strawberry-jalapeño salsa, strawberry jam, powdered sugar and micro mint on a unique French Toast-battered flour tortilla. The Bacon & Eggs (#19) with smoked cheddar, charred poblano salsa, chili butter and tater tots on a corn tortilla. And, last but most certainly not least, the Chicken & Waffle (#18) that starts with a thin, slightly sweet waffle tortilla loaded with crispy chicken tenders, green apple slaw, maple syrup, peppered bacon, red chili aioli and peppercorn gravy. The latter gave us a completely renewed obsession with chicken and waffles. And we have the sticky syrup face to prove it.